If you feel like biting into a fried squid on a stick while watching a man wheel a baby carriage of cats around the streets and charging people a couple of bucks to cuddle them, get yourself to a Taiwanese night market. They’re all over the island, from Taipei to Tainan, and they’ve got a unique and very different energy from a regular street market you’d happen upon in daylight. Neon flashing lights, quirky characters, dimly-lit alleys where fortune tellers advertise their services, kids running around with paper lanterns, and snacks upon snacks upon snacks. These legendary night parties are packed with strange and surprising little scenes everywhere. We watched a young vendor trying to sell a plastic gadget for juicing citrus fruits shouting his relentlessly passionate infomercial-style pitch into a megaphone. A crowd began to grow around him, which only bolstered his performance. Although his pitch was in Mandarin and we couldn’t understand him, the theatre and spectacle of it was hilariously compelling. There are all kinds of interesting foods on display for the adventurous eater—“stinky tofu” is a popular fermented dish in Taiwan, which you won’t have to look for whatsoever because you’ll smell it instantly. There are sizzling green onion crepes hissing on enormous iron skillets, pork dumplings, and barrels of hot chestnuts and tiny bananas from right off the trees. 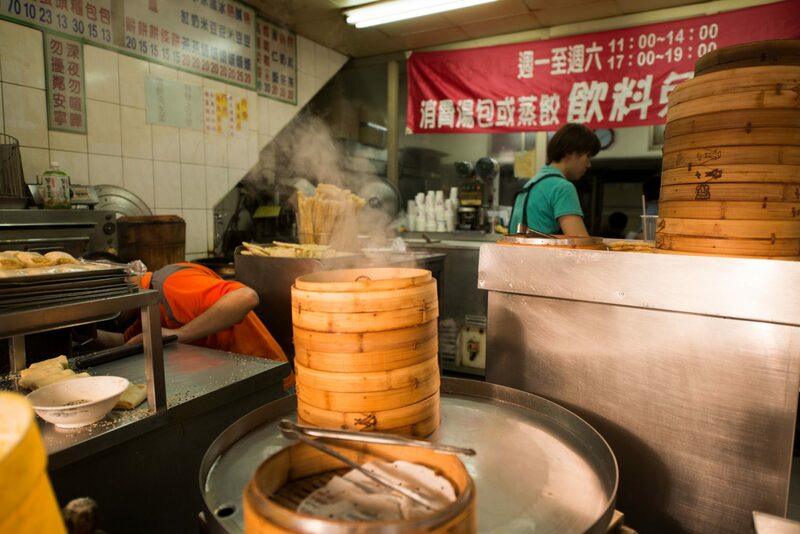 Dumplings are the standout Taiwanese dish. Over the course of the expedition I would sample everything from boiled chicken feet in a spicy sauce to hsinchu pork balls in broth to grilled street vendor squid. And dumplings, oh my, the dumplings! Pork, vegetarian, shrimp—an almost endless variety and flavour. I consumed probably more dumplings than I may ever be able to account for, but my favourite was definitely the pan-fried dumplings, which, unlike their steamed counterparts, are somehow both soft and crunchy. During the pinnacle of my dumpling consumption frenzy, I was shown an interesting and delicious way to dress the dumplings. Essentially, you place two parts vinegar and one part soy sauce in a little dish with some shredded ginger on top and then you quickly dunk your dumplings into the mixture. The flavour is strong and savoury, and makes an excellent addition to the texture and taste of the dumpling, whatever their content. I definitely gained about five pounds, the substantial portion of that weight consisting of dumplings. It was worth it. Bustling with life, Taiwan’s night markets are the place to be. But there’s more than just food at these markets. If you wander into these markets far enough, you’ll often discover a row of vendors providing curious services like eyebrow threading, their customers planted in front of them in office chairs so people can stop and watch how the handiwork is done. Beyond that, additional vendors in the back are selling clothes and purses and shoes and Hello Kitty imprinted on household objects you wouldn’t think could possibly be Hello Kittied. I love the night markets—they’re like a microcosm of Taiwanese culture, a tiny society where everyone from all stages and moments of life gets in on the action. We watched a little girl wielding a spaghetti strainer and terrorizing a plastic bucket of goldfish her parents were trying to sell. Elders sit on the sidelines chewing and spitting betel nut, their teeth and gums stained dark red from the juice. Tourists, locals, everyone caught up in the dizzying buzz of activity. 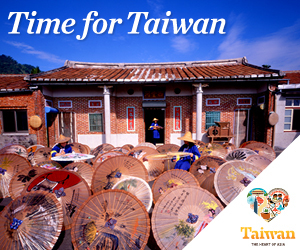 The most well-known night markets in Taiwan are The Raohe Street Market in Taipei, which is the oldest one around, and the Miaokou Night Market in Keelung, up in the north outside of Taipei, which has been running since the Japanese occupation. And that’s saying something. Sophie Kohn is a writer (and stand-up comedian) from Toronto who works at the Canadian Broadcasting Corporation and was part of Team Outpost Taiwan. 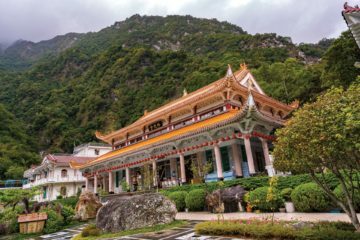 These 3 National Parks Show Just How Diverse Taiwan Really Is!